Inoh Tadataka was born in 1745 at the coastal village of Koseki , Yamabe County, Kazusa Province (present-day Koseki, Kujukuri Town, Chiba Prefecture). After his mother’s death at age six, Inoh’s father left Kujyukuri and moved the family to Yokoshibahikari, a town located in Sanbu District, Chiba where Inoh would spend most of his early childhood before being taken in by and married the daughter of a merchant family at age 17. Tadataka’s adoptive family lived in Sawara Village, now a district of Katori-City, Chiba, and was a rice trader who also ran a sake brewery. Tadataka thrived at his new home and successfully took over the family business while serving as Sawara’s village head until he left for Edo at the age of 50. 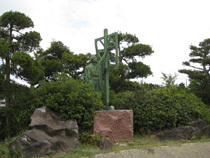 In commemoration of Tadakata’s 250th birthday and his outstanding achievements, a park with his statue and a medium quadrant sculpture were erected in 1995 beside the Birthplace Commemorative Monument. 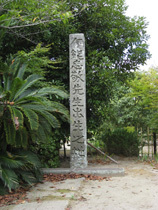 The monument commemorates Tadakata’s childhood years in Yokoshibahikari, Chiba Prefecture before he left for Sawara at 17 years old. 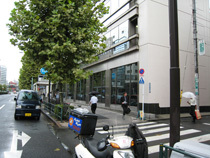 At the age of six, after his mother passed away, hiss father moved to his original family, the Jimbo family in Yokoshibahikari with his children except Tadataka. It was four years later, at the age of 10, when he rejoined his family and grew up until he married into the Inoh Family at the age of 17. 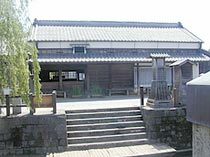 Tadakata lived on this house from the age of 17 to 50. During this time, he devoted himself to public service as the head and guardian of the village while successfully running his family’s sake brewery. The retail premises, the front gate, the study room and the storehouse have been designated as the National Historical Relic Site since April 25, 1930. For more information about the Former Residence, please click here. The shrine is devoted to the guardian spirits of Honjuku Unit of Sawara Village.Tadakata was involved in a conflict during a annual float festival of the shrine. 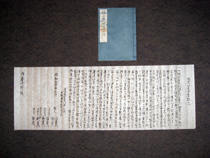 A letter Tadakata wrote on behalf of his village, appealing to the Shogunate officials called the riverside-collectors for tax exemption. He however, dropped the appeal and ended up in paying all the villeger’s dues by him and one of of his relatives. Tadakata traveled to Matsushima from May to June in 1778 by exiting through the Pacific Ocean and returning through the inland road. 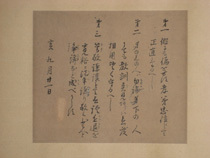 During his month-long trip, he spent his time writing haiku（外部サイト） and reading waka（外部サイト） written by classical poets Matsuo Basho（外部サイト）, Fujiwara no Teika（外部サイト）, Saigyou（外部サイト） among others. 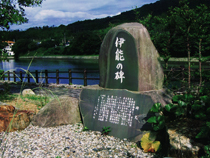 Tadataka visited this shrine when he went to Iwanuma City, Miyagi Prefecture. 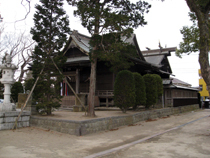 According to verified records, the shrine was built in 842 AD in honor of the guardian spirits of Ohshu (present-day Tohoku, the north east district of Japan). 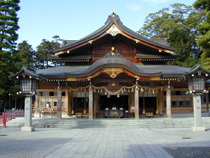 The shrine, visited by numerous pilgrims, including the Edo poet Matsuo Basho, is considered as one of the three most venerable Inari（外部サイト） shrines in Japan. "First, never lie or bear false witness to others and be honest with everyone you meet. Uphold filial piety and obey your parents. Be loyal and sincere to your siblings. Second, hear the views and opinions not only of your elders and teachers but also of those who are younger and inferior than you and be open to good ideas. Third, behave with cordial respect for others. Choose modest language and avoid conflict with others." 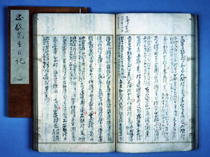 While still living in Sawara, Tadakata taught himself to read the almanac. 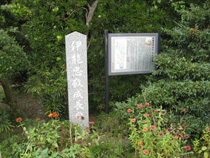 A year before his retirement, he made a pilgrimage to Ise Grand Shrine and during his journey, learned to measure the azimuth direction and degree of latitude. When he was 55 years old Tadakata made his first actual survey along the southern coast of Hokkaido and completed nine other actual surveys by walking and measuring distances across the country. He finished his surveys at 71 years old and three years after his death, through his assistants, the map of Japan was completed. 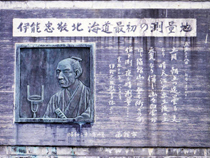 Tadakata lived in Kuroe Town, Fukagawa in Edo from the age of 50 to 69. 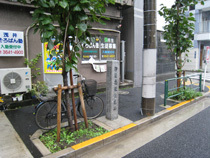 He made it part of his ritual to visit the nearby Tomioka Hachiman Shrine (Registered Historical Relic of Koto Ward, Tokyo) every time he leaves to do a survey. 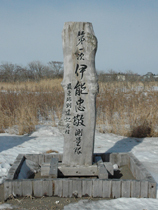 A commemorative stone column was erected by Bekkai Town, Hokkaido in 2004 to commemorate Tadakata’s initial survey along the southern coast of Ezo (present-day Hokkaido). He worked in Nishibetsu, which was also the northernmost and the easternmost survey point for him. A land mark was erected in commemoration of his polar star observation during his second survey in 1801 near his birthplace. 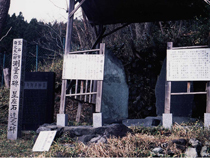 In 1814 Kasai Masahiro, an astronomer from Tohni, erected a constellation stone and a monument (Designated Historical Site of Iwate Prefecture), to commemorate Tadakata’s survey of Tohni Village (present-day Kamaishi City, Iwate Prefecture) In 1801. 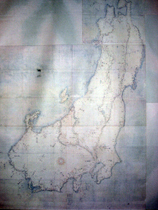 In 1802, Tadakata surveyed Kisakata in Akita Prefecture. It was a scenic spot similar to Matsushima with several islands dotting sea. The following year, the sea floor rose and created small hills covered with pine trees. 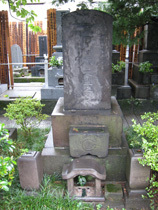 In 1813, Sakabe, Tadakata’s most trusted member of the surveying team, passed away. 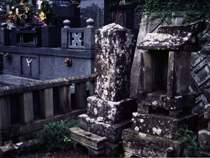 Deeply saddened, Tadakata was quoted saying, “It is like a bird losing its wings.” Sakabe was buried at the Soenji Temple on Fukuejima Island in the Goto Archipelago（外部サイト）. 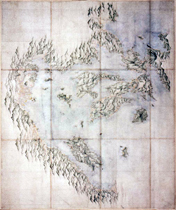 In 1812, Tadakata surveyed Yakushima（外部サイト） for about a month from March to April. 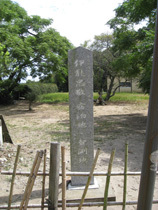 That was the southernmost point of his survey and a commemorative landmark was erected by the town of Kamiyaku in 2000 to honor him. Tadakata lived in this area when he moved from Kuroe Town to Kayabacho to finish mapping Japan, however, he died at age 73 before completing his life’s work. Fortunately his apprentices continued his mission and were able to finish the entire map three years after his death. 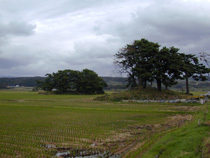 Tadakata set this place as the starting point of his survey along the Tokaido Highway to make taking measurements more convenient (National Historical Site). 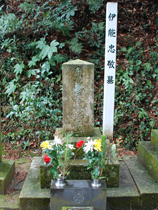 In accordance to his will, Tadakata was buried next to his mentor, Takahashi Yoshitoki. 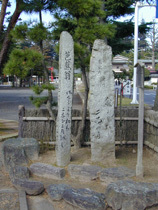 His friend, Sato Issai made an inscription about his life on the grave marker (National Historical Site). 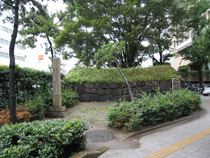 Tadakata’s hair and nails are said to be interred at the Inoh family temple of Kanpukuji in Sawara (Designated Historical Site of Katori City). 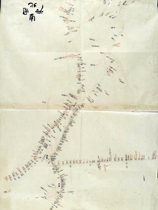 Also known as Dai-Nihon-Enkai-Yochi-Zenzu or “The Map of Japanese Coastal Areas,” the Inoh Maps were completed in 1821. It consists of large and small-scale maps of Japanese coastal areas as well as other maps of the country’s famous sites. 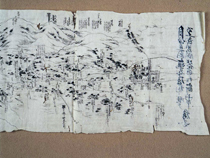 Due to Tadakata’s modern surveying techniques, the Inoh Maps were exceptionally accurate and since all were skillfully hand-produced, were also considered works of art. A draft map based on the surveying data. After a few corrections and adjustments, it became the basis of the Inoh Maps. This large map was then scaled down to create medium and small maps. The draft used color-coded legends to label the land’s topography. Scarlet represents the lateral lines, blue represents the seas, yellow lines are for the beaches, and green lines represent mountain ranges. 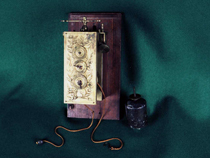 This was created based on Tadakata’s first to the fourth surveys. The map was then presented to the Shogunate of Japan. 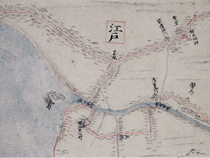 Tadakata specially created this map due to its picturesque landscape. 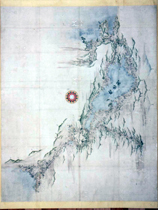 Another map created by Tadakata because of its scenic landscape. 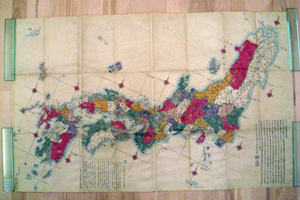 A picture of one of Japan’s earliest maps before the Inoh Maps. 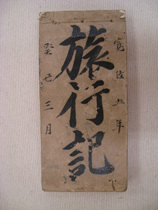 Although inaccurate, it was published and widely used during the late Edo period. 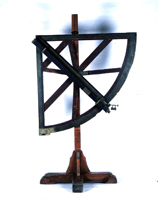 An instrument used in intersection surveying to correct errors in the graphical traverse survey method. 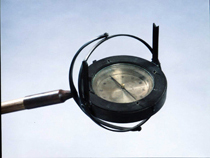 It is a pelorus designed to measure the angles of mountains. 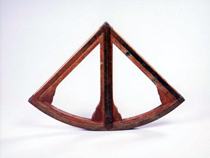 A tool used for measuring vertical angles. Once the vertical angles and hypotenuse are determined, surveyors can calculate the scaled horizontal distance for the map. A more compact version of the medium quadrant with the same functions. 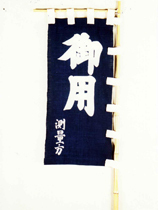 This flag was used by Tadakata’s team to indicate that they are on official duty when conducting nationwide surveys. 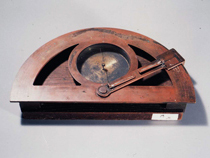 This pendulum chronograph was used in surveying longitude and it can count approximately 59,000 cycles in one day. 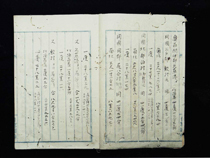 For 17 years, between the ages through 55 to 71, Tadakata‘s kept a diary while conducting his nationwide survey. The diary shows the detailed routes he took throughout his ten surveys. 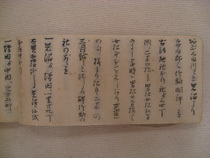 Tadakata recorded in these journals the bearing angles of mountains as well as the land’s other topographical features. These records comprise a total of 67 volumes. 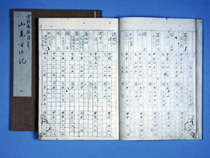 The survey entry on Tadakata’s records were recorded to determine one degree of latitude.